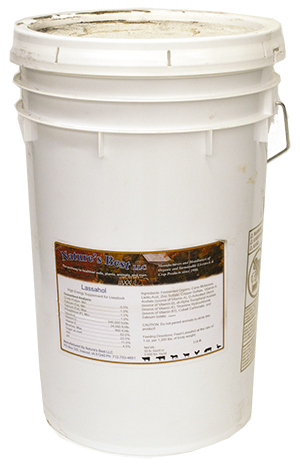 A “super tonic” nutrient liquid that is so strong a full dose is only one oz/head/day. 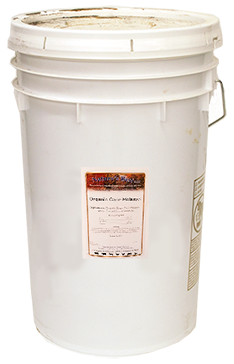 The liquid base of organic molasses has been fermented by non-GMO microbes to a 17% alcohol content. Metabolically it is categorized as a powerful hydrogen donor to activate the Krebs cycle to make energy happen in the body. It contains therapeutic levels of zinc, copper, cobalt, iodine, high levels of vitamins A, D3, and E, as well as the essential amino acid thiamine. Can be mixed into silage, or feed concentrate or spread over stored forages. When mixed with ACV it is much easier to dose and there is a strong syngergistic effect making both products work even better. Finish animals to Choice in a very short time, and, protect their digestion, immune system and reproductive health while you are at it! This is pure, organic energy. It works in several ways to boost daily gain as well as increased deposition of intramuscular fat. Easy to give, extremely tasty and contains valuable essential minerals as well.